The President’s SONA announcement of a transfer of responsibility for ECD centres from DSD to DBE and the intention to introduce two years of mandatory preschool education is an opportunity for South Africa. It is an opportunity to make children and young people the National Project, to place human agency at the centre of national development and to begin to meet the Constitutional imperative of putting the interests of children first in all matters pertaining to them. At the same time, we must understand that the ecosystem for ECD is a rich and vast network of stakeholders – from parents to childminders to private practitioners to non-profit organisations to social franchises to government departments. Unlike social arms of government like the public education and health systems – where the State is both the funder and provider of services – many aspects of ECD are privately provided often by people who rely on that income to survive. Parents’ fees, community contributions and donor funding supplements – and often exceeds funding from the State. These realities don’t necessarily mean that the system should not change, but we need to understand that this change will have major ramifications for communities and practitioners across the country. We must, therefore, ensure that the end results of the proposed changes achieve the goals of the National Development Plan and the National Policy for ECD – namely universal coverage of a basic package of services by 2025 and a comprehensive package of services by 2030. The current provision of ECD exemplifies a true partnership – a social compact across Government, civil society, business and the donor community; and any change must build on, and not undermine that partnership. The ecosystem for early childhood development in South Africa is a rich and vast network of stakeholders – from parents to childminders to private practitioners to non-profit organisations to social franchises to government departments. Here SmartStart facilitators are running a session with children in Keiskammahoek, May 2018. SmartStart is a social franchise delivered through playgroups, day mothers and ECD centres, and is working to expand universal access to quality early learning in South Africa, for children aged 3-4 years old. Image by Bart Love. Expanding ECD services presents an exciting opportunity to get the system right for children because it is quite underdeveloped. In South Africa, we have a relatively strong system of antenatal and post-natal care, but the other components of ECD are inadequate. If care during pregnancy, and during and after birth, is the foundation of ECD, nutrition is the ground floor. And here, we’re still missing at least a quarter of the building, in that 27% of our children under five are nutritionally stunted. Parental support and child protection maybe constitute the second floor, and we know that there are lots of holes in the adequacy of provision for these elements of ECD. The next floor – early childhood stimulation and early learning – is only half constructed and at least half of that which has been constructed is of poor quality. So, unlike education or health where the best we can do is retrofit the building, there’s still lots of opportunity to design the ECD infrastructure bottom-up. It should go without saying that the systems infrastructure for ECD should be designed with its primary users in mind. The first principle is that early childhood development is multi-faceted and includes maternal and child health, nutrition, child protection and social security and emotional and cognitive development. We should not confuse early learning – a component of ECD – with the full package of early childhood development services. The second principle is that the design of services should following the child’s natural development from conception to six years of age and beyond. This is especially important for early language development and cognitive stimulation because a child’s brain does not develop backwards! In fact, the brain is most sensitive to stimuli for development in the first three years of life – and if we neglect that period of life, we place children at a life-long disadvantage in terms of their education and future life prospects. Thus, if we now intend to place the most focus on Grade R and Grade RR, without commensurate attention to children aged 0-3 years of age, we will shoot the future of our nation in the foot. A third and related principle is that we should design a continuum of services most responsive to a child at a particular age. So, for example, great maternal and child health services should be followed by group support for emotional, cognitive and neuro-motor development; and children at risk visited regularly in their homes. As infants become toddlers, they need to be able to socialize with children outside of their families, and so playgroups become important. Participation in playgroups should lead to participation in centre-based services as children get older. A fourth principle is that the younger the child, the more integrated the provision of services need to be. Nutrition, socio-emotional development and early learning cannot be separated from each other – even for 4-5-year-old children. The fifth principle is that we must meet our Constitutional mandate to put the interests of children first in all matters pertaining to them – above all other concerns and interests – as we design the optimal ecosystem for children in South Africa. First, countries that have made great strides for children have high level strategic and operational integration of programmes. In other words, the intention to coordinate services – so often expressed in national plans of action – is actually carried through because the implementing agencies have the authority to do so. That is not to say that everything about children needs to be coordinated and departments can get on with their specific mandates related to young children, but there are crucial functions of ECD that fall between the cracks – such as nutrition, early language development and cognitive stimulation, and inclusion of children with disabilities. Second, countries that have made great strides for children typically have a branded national programme of action that pulls all the strands of ECD together. Think of Oportunidades in Mexico, Bolsa Familia in Brazil and HeadStart and SureStart in the US and UK respectively. A third success factor is almost inevitably that these programmes have been driven by a central agency – that doesn’t do the work of other departments, but which gives strategic direction and develops programmes for those ECD services that fall between the cracks. A relevant example is Singapore, which has created an agency for children under the Ministry of Education, but where senior officials from the equivalent departments of health, social development and home affairs are seconded full-time to work in that agency, achieving an unprecedented level of integration. Now we have had many experiences with government agencies in South Africa, and we often picture them as bloated and ineffective structures. But it doesn’t have to be that way. The experience of Latin American countries is that a lean and responsive agency can be created that single-mindedly drives the agenda for children. Is the proposed redesign of ECD coordination fit-for-purpose? In the light of the design principles I have described and the lessons from other countries, we can now ask ourselves whether the proposals that have been made – that will soon be framed in a government proclamation – are really fit for purpose. Is it the optimal plan to meet the goal of universal coverage of a comprehensive package of quality ECD services by 2030? Let us start by considering the resourcing of ECD. We know that the ECD sector is substantially underfunded, probably requiring an additional R25 billion a year by 2030 to meet the goal of universal coverage. And because there is no money for services, there has been little investment in developing the human resource base for ECD. One of the potential benefits of moving coordination of ECD to the Ministry of Basic Education is that it will create a positive pressure for greater investment in early learning as part of the continuum of education in South Africa. Departmental officials will make the case for greater investment in early learning as a key strategy for improving educational outcomes – and the money may start to flow. But if we think about the institutional arrangements for ECD, the biggest problem is not that the coordination of ECD is mandated to DSD, but that the current system does not enable effective coordination to take place. Our current system – with an Inter-Ministerial Committee and then high-level inter-departmental coordinating committees does not work well. Why? Because the mandate for implementation is then delegated to directorates in the respective government departments, and they lack the authority to achieve the operational integration that is really required. Key responsibilities – an integrated nutrition programme for children under five, early language and literacy development, inclusion of children with disabilities – continue to fall through the cracks. So what will move South Africa forward, in terms of the development of its children – regardless of whether DSD or DBE or the Presidency takes the lead? Again there are three crucial strategies that could boost child outcomes over the next five to ten years. The first is an Early Years’ Index that would collate child outcomes information from national surveys and monitoring data, and link it to data telling us how close we are to our goal of universal coverage of quality ECD services. We must be able to gauge progress over time and highlight where we are making great progress and identify where the gaps still lie. The second booster strategy is the rapid scale-up of programmes that have been designed to go to scale – among others, building on the work of resource and training organisations and social franchise delivery platforms that have been developed over the past few years. The third booster strategy would be to develop a systems ‘nerve centre’ for young children – an ECD agency that could be based in the Ministry of Basic Education – but with enough authority, flexibility and autonomy to work across departments and with public and private providers and investors. The role of this central agency would be to: i) synthesise and analyse data about children and make it regularly available; ii) drive a branded national programme along the lines of Bolsa Familia or HeadStart; iii) design and support national programmes that address some of the critical gaps in our current portfolio of strategies; and iv) develop the systems and processes of quality assessment and management to ensure that programmes are effective. Learning from Latin America, this national agency could be small and flexible, with a public mandate but the ability to draw in and work with academics, civil society and funding partners. The provincial branches would procure the services from a range of players – based on the goal of comprehensive and universal coverage for all children in each district of the country – and ensure quality through the processes designed for the national system. There is definitely a case to be made for locating ECD services for 4-year-olds within the school system, as long as it is understood that 4-year-olds learn through play and not lectures! It would be great to have a seamless progression of children from Grade RR to Grade R and into the foundation phase – so that they are ready to read and to learn when they start formal schooling. In fact, some schools in South Africa do this, with good success. But this can only happen where the conditions are right. We cannot have a four-year-old child walking in the dark on a winter’s morning to a school where they are likely to be bullied or even fall into a pit latrine. Thus, there would need to be a very clear set of requirements that must be in place before we can consider mandatory attendance in Grade RR – if that means compelling the children to get to and from schools. 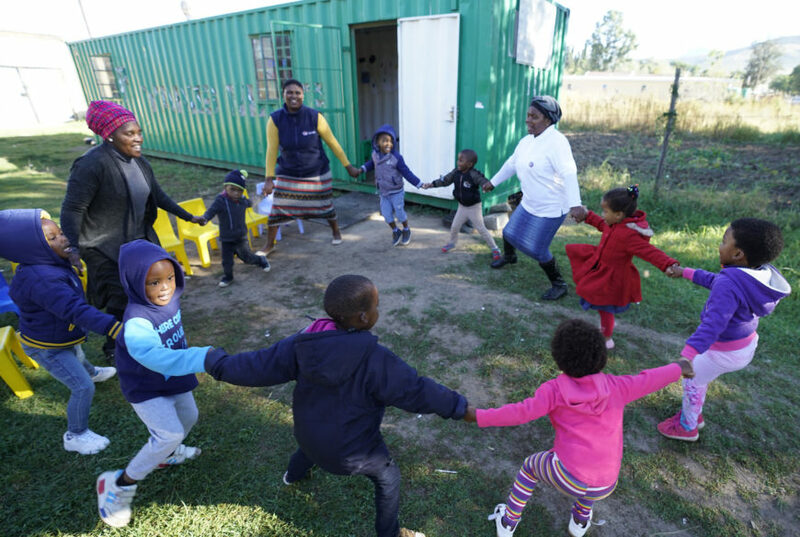 Given the South African realities, it would make far more sense to strengthen the network of community-based ECD playgroups and centres rather than trying to make the massive investment in customized infrastructure that would be required in schools to make this proposal viable. We should also remember that probably most of the resources for early centres are provided from non-State sources – the per capita subsidy payable to children in registered centres supplements the parents’ fees, donor and in-kind support provided by literally thousands of non-government organisations, small and large business and faith-based organisations. The full value of this social capital should be taken into account before Government decides to bear the entire cost of Grade RR – as it is very unlikely that parents, civil society and donors will continue to provide support once the service is provided entirely by Government. As we try to expand access to quality ECD, let us build on the strengths that exist in the current system: the rich network of service providers that need further support and capacitation; a system of public financing that could be extended to both centre- and non-centres based ECD; and the service delivery platforms that have been designed for scale. It would be a travesty if we spent the next five years focused on the bureaucratic detail of the transfer of functions from one government directorate to another when the real need is to reach hundreds of thousands more children with quality programmes over the next five years. We form part of a group of national and international donors who have worked with Government for over a decade in preparing for the window of opportunity to put in place the optimal system for providing ECD services for children; a system that would reset the trajectory for human agency and human capital development in South Africa. If we can together design a system that does that – that resets the trajectory for children, for education and for the country – then the donor community will be right behind government for the long term. For references to the above comments view this short accompanying document which summarises the international experience around the organisation and management of ECD services. The document can be accessed here.